Watch The Video Below To Discover The Exciting Details! WOW this is one pretty awesome plugin. As a developer I can definately say it's very impressive the amount of features pack into this tool. If you're doing memberships and you need it done fast, Swift Member 2.0 is your go to tool. Dynamic Sales Technology Across All Major Payment Platforms! Keep Paying To Access Month After Month. this plugin is a must have for anyone doing courses and memberships online. No hype or fluff, Swift Member 2.0 is no fly by night tool, it's the real deal. Watch Your Daily, Weekly, Monthly or Even Yearly Income Revenues As Customers Pay to Access Your Membership Or Course. All In Just a Few Simple Steps! Swift Member 2.0 Uses Our Own Special Technology To Automatically Add Your Content to a Professionally Built Membership Site That’s Easy For Your Customers To Use And Navigate. That’s why went to work, painstakingly creating a way that would allow us to easily insert our content into a simple system that automates all the features of what an effective membership site should do. … a software that would allow us to automatically hook up to payment networks at the click of a button. A Super Technology that’s ready to work tirelessly for your business, creating membership sites that connect with payment networks and ensure your content is for your customers’ eyes only. while you pick up the monthly checks! This software works with a really easy to understand a work membership portal for each product. You can assign as many products as you want to a membership. Each of these represents a different level. No Programming And NO Tech skills required. while capturing more leads and retaining high customer loyalty than you ever thought possible! but I don’t want you to stop with this software! Inside this system I’m going to let you look over my shoulder as I take you by the hand and lead you through how I create high retention membership systems! You simply need to copy what I do and cash in! I’m going to detail in this system exactly how I drive masses of traffic utilizing the Swift Member Software & System over various payment networks to build a recurring income model simply and easily! You’re also going to learn how you can generate countless products through this system at WILL whether it’s for your own business or that of your clients. This all ties in smoothly with the Swift Member software because with just a copy then paste you can choose whether you want to create one-off products that have your customers paying you monthly, or entire membership sites with content being updated on a regular basis. And do it immediately to start generating a profit. Imagine being able to ask any question you want as we showcase this software, system in action! If you'd like to see that and have the opportunity to ask any question you want we're adding in as a bonus a complete session that's sponsored by the Swift Member team. In just a few days after opening this training system is going to be sold for no less than $497, but it is included for you - 100% free when you grab copy of Swift Member 2.0 right now. This is the ONLY place you’ll see a software like this! …And even if there was one there is literally no chance that you’d get such a comprehensive training system included with it! 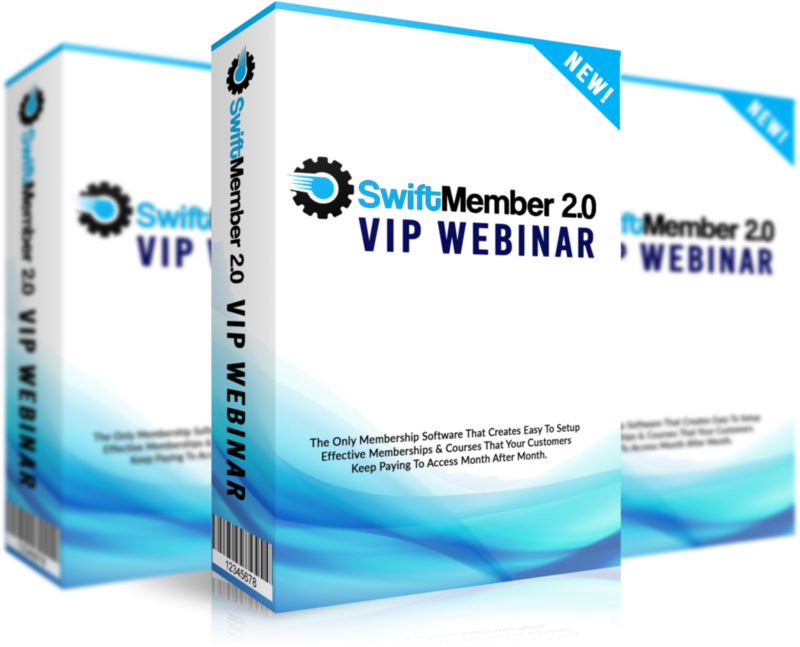 Click the button below to get access to Swift Member 2.0 immediately and the comprehensive system for making money utilizing this software. You’ve heard for too long… people making money hand over fist through recurring membership models. It’s now time that you claimed your piece of the pie! 100% risk free with an ironclad guarantee. Satisfy your curiosity and get access right now. The reason you’re seeing this page and massive discount is that you’ve either stumbled across this page completely by chance or one of our close JV’s have sent you here. Either way, you’re lucky because this special won’t be available for long. If you’re thinking “Wow I can’t believe how much value is here” then I agree… you’re right! Even if you just use the Membership Site Builder technology you’d be easily getting your money’s worth within the first week! If not the first day! That’s because this software… (like Apple releasing the first iPod) is ahead of it’s time! So giving up on this… scrolling away or deciding that you’ll ‘come back later’ is like flushing money down the toilet… This is to bigger opportunity to pass up! If you miss out on this launch promotion it’s like kissing good bye to your piece of the massive profit filled Facebook pie! So instead of letting that happen and feel regret, guilt and disappointment, get access to the Swift Member 2.0 system right now, with the massive 89% grand opening discount, and our iron clad 100% guarantee. Incredibly Limited 7 Day Launch Discount. You Must Act Right Now. You’re going to love this! Guarantee terms: Get access to Swift Member right now completely risk free for 30 days. Even if you don't use it for a few weeks, you'll still have time to put Swift Member to work for you to build your list and make money online. And, if at any point during the 30 days, you decide you'd like to go back to the old way of doing things, with expensive developers, and clunky softwares, high fees and low customer retention rates, I’ll quickly refund every penny of your investment. You face no risk at all, and I know you'll love Swift Member, so get access right now. OUR COMPANY IS DISTINCT AND INDEPENDENT FROM JVSHARE, LLC OR JVSHARE.COM OR ANY OTHER ITERATIONS REFERENCING JVSHARE AND IS NOT AFFILIATED, CONNECTED WITH OR ASSOCIATED WITH OUR COMPANY IN ANY WAY, INCLUDING BUT NOT LIMITED TO OUR COMPANY'S PRODUCTS OR SERVICES. ALL STATEMENTS ON THIS WEB PAGE ARE MADE INDEPENDENTLY BY OUR COMPANY AND OUR COMPANY ALONE IS RESPONSIBLE FOR MAKING THEM AND SAID MATERIALS HAVE NOT BEEN REVIEWED OR APPROVED BY JVSHARE, LLC OR JVSHARE.COM.